I open one of the boyz' backpacks and there it is. The dreaded (to me, anyway) Class Party Invitation. Meanwhile, my child is thrilled because YAY ANOTHER BIRTHDAY PARTY [WITH CHEAP TRINKETS AND SUGARY CAKE AND] CAN I GO? CAN I GO? CANIGO? We have hard and fast Birthday Attendance Rules in our Trenches that we try to stick to. If neither Hubby nor I has ever heard our child MENTION the birthday boy/girl...then it's a no. If we already have plans, then it's a no. If we ask our child if he WANTS to go and he is ambivalent or doesn't care if he doesn't go...then it's a no. Now lest you think that my poor boyz NEVER get to do ANYTHING with their friends, that is hardly the case. If we are family friends, then it's pretty much always a yes. If my son expresses interest in attending and shows excitement about the party, then it's (usually) a yes. Trust me, all 3 of my boyz DO go to PLENTY of birthday parties. When there is only a PHONE NUMBER to rsvp! Doesn't everyone have e-mail? Parents of the Birthday Child: Throw me a bone and leave me your e-mail address so I can at least shoot off a quick e-mail to you that my son can't make it. Quick, easy, painless. But when you merely leave a phone number, I stall. I procrastinate. I hesitate to pick up the phone, lest I actually have to talk to a real, live person. Issues. I have them. Obvs. So are your children party animals or do you set party-going limits? I try to call at add times so the changes of leaving a message are higher. I can handle leaving a voice mail! Oh you are not alone. I always provide an email address on my invites. If there is only a phone number on an invite we receive I pray for their voice mail. My kiddos are still pretty young (eldest just started Kindergarten this year), so our party-going is restricted to family and a few friends here and there. I tell you what drives me loopy - when parents don't respond and are given an email and phone number. Parallel lives, sistah. I am EXACTLY the same way, and boy oh boy do I raise a stink when there's only a phone number on the invite! GAH!!!! Totally agree with you! 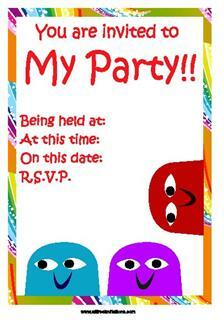 I hate when the RSVP is just a phone # and I don't even know the parents name. Eek, awkward! I am not allowing attending my boys in a party if I did not know personally the parents of their friends. I find life with 2 kids busy - let alone with three kids! However as the parent of a wonderful & fun boy who has trouble making friends, I often invite all the boys in the the class to the party. Totally agree about the phone number...plus, who wants all of those calls? I'd just let them go to voicemail if I were dumb enough to only include my #. "A" to the "men" on the no email for RSVP thing. I'm the same way. Don't make me call you!! Also, paper invites are so 2000, get with the 2010s and use Evite for crying out loud!